This popular Rockford Fosgate 4×6 speaker came top of our list for various numbers of design and performance reasons. This amazing speaker is one of the loudest 4×6 speakers and the speaker construction is just awesome. The speaker has a mineral-filled molded cone along with a PEI dome tweeter in a beautiful Flexfit basket design. Let’s check out the basic features. If you’re all about the bass, this may be a little disappointment for you because the bass output is average. This infinity kappa 4×6 loudspeaker comes second in our list of the best 4×6 speakers. It is a popular product among sound enthusiast looking to improve the sound production in their automobile system. This speaker has got some very nice features that will make you love it and it produces really great sounds at both low and high volumes. It can easily be proclaimed as the best 4×6 speaker with an excellent bass output. Pioneer is a big name in the speaker industry hence it is not surprising that it comes in as one of the best 4×6 with good bass for those who seem to be all about the bass. The speaker is made from quality materials to produce one of the best 4×6 speakers with excellent sound quality. The features are great and for a speaker of such small size and price, the output is excellent. This 4×6 speaker from Pyle Audio has been around for a while and it has received great patronage and acceptance from sound enthusiasts. With one of the most affordable prices around for 4×6 car speakers, this Pyle PL453BL speaker also has great features to complement the quality that has given it great acceptance since its launch. Among this is the inclusion of wires, grills and mounting hardware. The blue poly-injection cone as well as the high temperature ASV voice coil makes the pyle speaker a top choice among car speaker shoppers. 250 Watts of perfect, quality sound, easily one of the best 4×6 speakers around. The sound at low volume is not so very good. The Kicker 40CS464 4×6 car speaker is not just one of the most affordable car speaker options you have. It produces great sound as well making it one of the most sought-after speakers when planning to replace factory-fitted speakers. The speaker has some really interesting features that are uncommon in most 4×6 car speakers within its price range. Among these are the polyester foam surround for speaker protection and a polypropylene cone for quality sound output. The power is rated at 150 Watts, a little below what some other quality speakers on our list offer. The Boss Audio car speakers are known for their quality as well as their power handling. Each speaker is able to produce 125 watts contributing to the total 250 watts total output. The poly injection woofer cone allows for better sound production. The one-inch tweeter and one-inch polyimide dome helps to reduce sound distortion as well as contributing to the sound level. The rubber surround also ensures the speakers are well-protected to help with durability. Altogether, these make the Audio Boss one of the most-loved car speakers among the best 4×6 speakers available in the market. The design is made to provide more quality and durability. The sound output is excellent. The tweeter allows room for sound modifications. The speaker comes with three years warranty. For a speaker of such reputation, the power handling level is quite low. Here comes another Pioneer Speaker and we’re not surprised because the company is known for the quality of most of their speakers. The TS-A4676R is another quality Pioneer car speaker that is capable of breathing new life into your car’s audio system. These speakers are quite affordable and still are made from quality materials to allow better sound production to provide a great listening experience. All of the sounds will come alive as you’ll be clearly able to hear vocals, drums, guitars and all other sounds as the producers had intended. While some other speakers fail at handling low volumes, this 3-Way Pioneer car speaker is able to produce great sounds at high volumes as well as decent outputs in lower volumes. The Polk audio speakers are a great choice if you’d like to replace your vehicle’s fitted speakers. With the Polk Audio car speakers, you can easily start enjoying better sound production in your car without costing you an arm and leg. The Polk Audio speakers are marine-certified and can also be used in boats of all types. The speaker comes with a butyl rubber surround to protect against extremities in temperature and weather. It is no doubt that the Polk Audio DB461P car speaker is greatly loved among sound enthusiasts. This is down to some of the features above as well as some of the other key features we’ll briefly mention below to show why the Polk Audio is one of the best 4×6 car speakers in the market. The JBL brand name is one that should not sound new to sound enthusiasts. JBL speakers are known for their quality sound output along with an excellent bass to match. This is arguably the best 4×6 speaker available and it’s got some pretty nice features to make it a top choice for you. The speakers are well-engineered and have been produced from the best quality of materials. Some of these features will be highlighted below so you could know what you get with any of the premium quality JBL car speakers. It equally has an excellent bass output to match this. The cone are larger than those of others allowing room for more air flow to produce better bass levels. The speaker is durable and long-lasting due to the carbon-composite non-magnetic basket used. Because of the quality, the speaker costs a little more than some other 4×6 speakers. The Boss Audio speakers are reputed for their quality sound output as well as their inexpensive price. The Boss Audio BRS46 comes in arguably as the cheapest among the best 4×6 speakers currently available in the market. This speaker retails for a few bucks and still has a decent sound quality and features that made it a popular choice for people looking to replace factory speakers with better but cheaper alternatives. We’ll briefly outline some of these features below and you’ll see why this inexpensive Boss Audio Speaker qualifies as one of the best 4×6 speakers on our list. The speaker comes with 3 years warranty, a symbol for durability. Up here, you have 10 awesome choices and options to choose when planning to get new speakers for your vehicle to upgrade your car’s sound system. Any of the speakers above will do a great job but it all comes down to what you want and how much you have to spare. Some of the speakers will produce bass that others will find difficult to produce. The JBL GTO6429 has one of the most excellent bass outputs you can get from any of the best 4×6 speakers available. The Polk Audio DB461P also delivers excellent bass at an affordable price. The Pioneer brands on our list too are available at mid-market prices and they deliver excellent sound outputs. While your vehicle will definitely come with some speakers for music and radio use, the best ways to enjoy sound outputs is to replace those with better speakers from audio-centric firms. 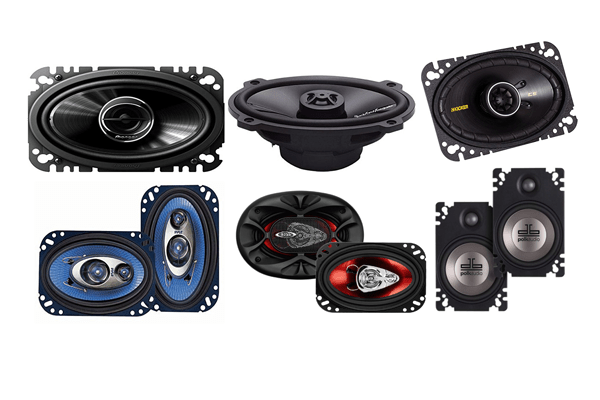 Because of the abundance of many companies producing different speakers for use, this list has been compiled to help you decide and choose one of the best 4×6 speakers with good sound output for your vehicle. Apart from being used in vehicles, some of these speakers are waterproofed and can also be used in boats. From the affordable ones to the premium-priced ones, you can easily choose from any of the speakers above. One thing that is sure though is that any one you choose among the best 4×6 speakers reviewed above will definitely upgrade your sound experience with better and quality sound production.